The deceased has been identified as Asish Kumar Ram, 24, from Raxaul in Bihar. According to reports by Kathmandu Post, he had sustained bullet injuries to the head and was reported to be in a critical condition before finally breathing his last. Narayani Sub-regional Hospital Medical Director Imamul Haq told news agencies that the injured protester had passed away before he could reach the hospital. "He was already dead before he could reach the hospital. He had sustained bullet injuries in the head," Haq was quoted as saying. The deceased was identified after a phone call was made to his maternal uncle from his mobile, police said. At around 3 am on Monday morning, about 100 policemen raided the bridge to remove the Madhesis, who have been on a 40-day sit in against Nepal's new Constitution. The police also burnt their tents. 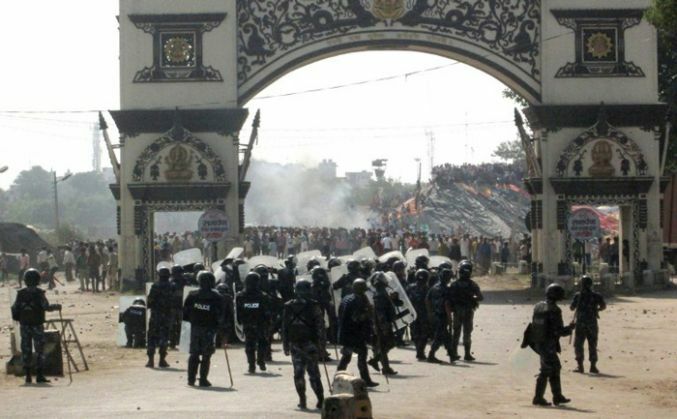 After removing the protesters, the police had opened the Birgunj-Raxaul border point, a key area from where essential commodities and fuel from India enter Nepal. After being heavily pelted by stones near the border, police officials resorted to firing dozens of bullets and tear gas. The reports further added that several protesters had sustained injuries from the rubber bullets fired by the security forces. Protestors have been allegedly pelting stones at Nepali security forces from Indian territory. Indian Ministry of External Affairs condemned the incident and said, "We are deeply concerned at reports coming in of firing today in Birgunj. An innocent Indian was also killed in the firing." "We are monitoring the situation carefully," it further added. #BiharPolls: Who is behind the stings against Grand Alliance and why?